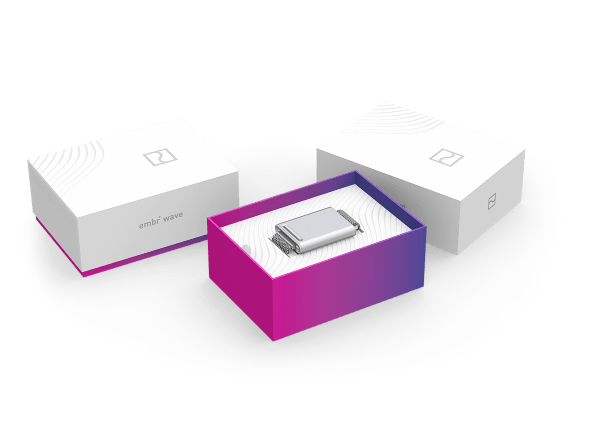 If you are not satisfied with your purchase from embrlabs.com, embrwave.com, or Kickstarter.com for any reason, you have 30 days from the date of shipping to request a full refund. You may return any Product (as defined below) purchased on embrlabs.com, embrwave.com, or Kickstarter.com in accordance with the terms below. You must return the Product to Embr Labs to receive a refund. Returned Product(s) must be in good physical condition (not physically broken or damaged). All accessories and packaging originally included with your purchase, including the product UPC barcode, must be included with your return. Purchases made between November 11 and December 31 may be returned through January 31 of the following year. If you return Product to Embr Labs (a) without a return authorization from Embr Labs or (b) without all parts and accessories originally included with your purchase, Embr Labs retains the right to either refuse acceptance of such return or charge you a restocking fee of 15% of the original price of the Product(s) or the retail value of the missing parts and accessories, whichever is higher.